The Justice League continues to face the approaching evil of The Dark Multiverse. There must be a source of hope in all of the nightmares they face... but what if there is not? Unfortunately, the concept behind Dark Nights Metal has started to wear a bit thin. In attempting to think of a way to summarize the events of this issue, it occurred to me that there really wasn't any way to do so. Describing this issue requires giving away the entire story, piece by piece. Worse yet, even after all of these events occur, nothing really seems to have changed. This issue is filler, plain and simple. That being said, it is gorgeous, well-written filler. 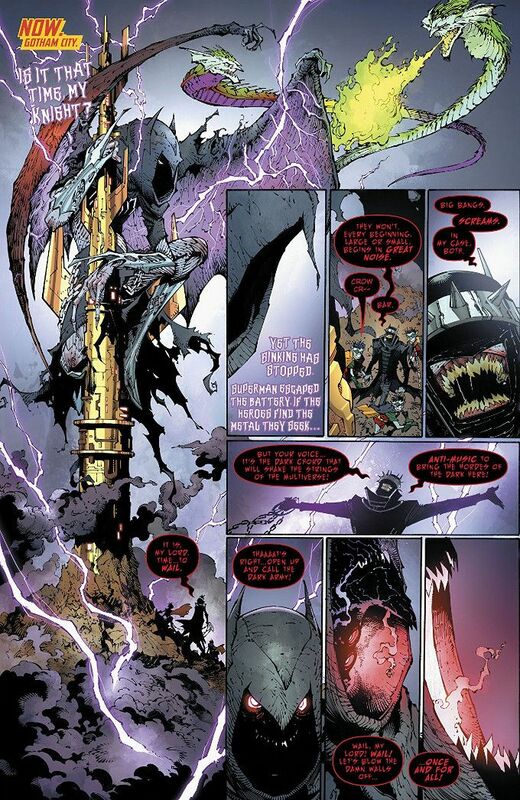 The artwork by Capullo and Glapion and Plascencia is as amazing as ever and Scott Snyder's concept informs a lot of interesting ideas. Ultimately and unfortunately, this issue is nothing more than spectacle. A fantastic spectacle, true, but still more flash than substance. The Final Analysis: 6 out of 10. As a concept, it's brilliant, but nothing really happens.